While I don’t usually write about myself on here, I’m very pleased to announce the launch of THE SWARM, my new venture that will be offering mobile consultancy, multi-platform content production and creative workshop design and facilitation. A full(er) website will launch soon. Please check out the site and get in touch if you’d like to work together. Yes, this means I’m leaving the BBC – officially in the early Autumn – after 8+ great years here. I’ve learned alot, had a great time and now it’s time for my next adventure. – Mass participation and creativity will grow (because more and more of the unconnected will become connected). So, broadly I was glad to see that alot of the experts in the industry were talking along the same lines. Really encouraged, actually, even if their predictions were generally alot more informed and nuanced than mine. What struck me though, is that there isn’t really a name for the trend that’s being widely predicted about what I’d call ‘the computing that happens around us.’ Broadly, I’d say this is a combination of: wearable/embedded/environmental technology, ubiquitous connectivity, context awareness and pervasive screens. Depending on who you talk to, ‘convergence’ has happened or is about to happen. iPhones and Android handsets are here, Netbooks are taking off and there’s that persistant rumour about the Apple Tablet and firm plans for other tablet devices (newspaper killers?!). Sooner or later, I think we’ll all end up with a ‘smart’ converged device that will connect into the ‘computing around us’ that I described above. So, I’d like to propose that at good name for this trend of smaller computing points on/in our bodies that connect to other computing points/screens in our environment be ‘divergence.’ Why? Because what fundamentally underlies it is a move from us each having one personal computer that we interact with to a world where we interact with many computers simultaneously and sometimes unknowingly, even if much of this computing is/will be consumed through our converged devices (which will remain important!). Broadcaster have had to (or are) shifting from a one-to-many model to a one-to-one model with their content. Soon, I think we will move from a one-to-one (or a few) model for our user-to-pc access to a one-to-many model for our pc/mobile access. 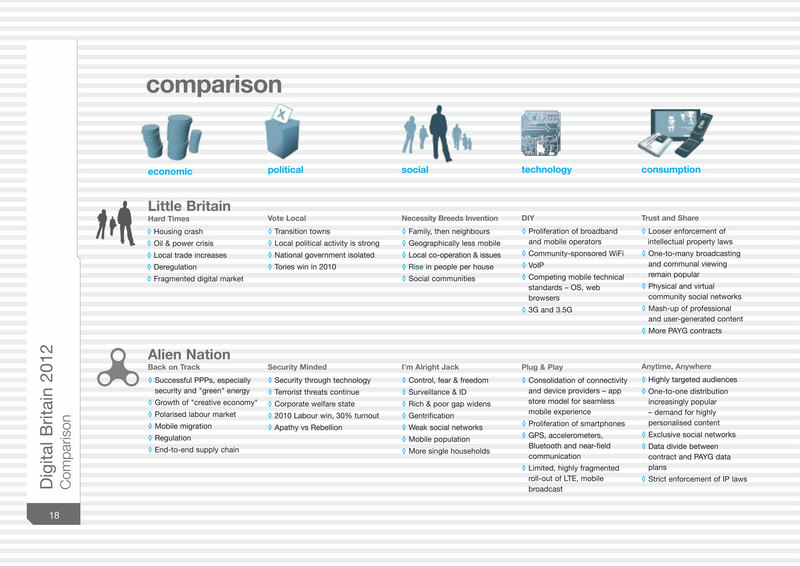 We’ll have devices that are ‘ours’, devices that ‘know’ (recognise) us and devices that are ‘unknown’ but that we still share information and data with (often in a passive sense) – the level of trust and permission we permit these diverged devices to have will depend on which of these categories they fall into. As much as it doesn’t feel like it, alot of the world still isn’t connected via PCs and this is something I’ve had a number of conversations about lately. 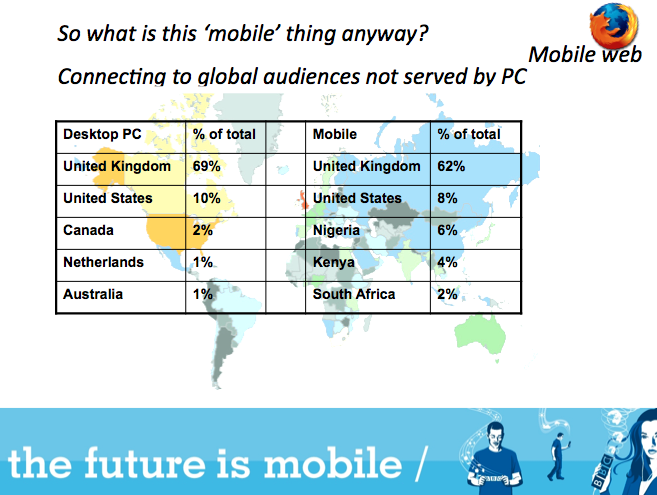 The role of mobile in this space is interesting to think about. Alot of folks (including some internally here at the BBC) were amazed to see how different the top countries were when you look at what we do by which type of device is connecting. It shows that there’s a massive opportunity to connect to people in the developing world via mobile. These are people who might not have the money or access to get a nice shiny new MacBook Pro (like the one that arrived on my desk this week!) and broadband but they do have mobiles and a desire to be connected to the digital world harness the power of the network. Another speaker at X Media Lab told me about an application in India that let’s farmers check to see what their crops are selling for in the markets near where they live so they can determine where to take their crops to get the highest profit. Brilliant! Closer to home… I had a conversation with a colleague yesterday about how these language services might also help speakers of these languages get online via their mobiles in the UK. A large part of the ‘digital divide’ (those without PC/internet access) are non-English speakers. And while they don’t have PCs, many of them have mobiles, so maybe the BBC providing content in their first languages will help them get online (via mobile) and get connected. Maybe I’m too idealistic, but thinking about this makes me hope that what we’re doing is making the world at least a little bit better. If you’ve looked at the BBC Mobile homepage today, you’ll have noticed we’re giving you more choices than ever. Yesterday we launched a carousel of content in our top promotion area so that you can scroll through a range of content we’re highlighting across BBC Mobile. It’s available to a limited range of handsets right now but will roll out gradually to a wider range as we develop the technology. I’m loving what James from Maps is doing on his blog. He’s been releasing homemade mixes of music he likes for his fans. Doesn’t sound particularly exciting? I think it is – its a great example of a musician using digital media to do for their fans the same things their fans do for each other. Anyone who’s a music fan or ever had a crush has made someone a mixed CD (or mix tape if you’re my age!) and being able to get something similar from your favourite artist is just great. OK, maybe not QUITE so personal – but I’m still loving it, especially since James is putting some context about the music around it. As part of the BBC Internet Blog’s day on mobile, I wrote a post about what we’ve been doing in terms of planning for the 2012 Olympics and mobile. Here’s an excerpt and a chart from the work. You can read the full post at: http://www.bbc.co.uk/blogs/bbcinternet/2009/06/looking_ahead_to_london_2012_t.html . Please let me know what you think of the work and if you want to know more! This is just one page from the much larger report/piece of work. OK, so I probably shouldn’t be promoting books I haven’t actually read yet but wanted to put up a pointer to this one after reading a great excerpt last night. I’m excited to get the whole book – looks like a great read and what I read was full of good stats. Sure the author is a guy with an agenda (heck, so am I) but he makes a very convincing case, not that mobile will replace all other media but that it is about to become a key part of the media ecosystem. Think about it – what’s the first device many of us look at when we wake up and the last one we look at when we go to bed? I’ll write more after I’ve read the whole thing. Download the excerpt I read.